Habit: Annual, perennial herb, shrub, tree. Stem: 4-angled or cylindric. Leaf: simple, entire, generally opposite, 4-ranked (alternate, whorled). Inflorescence: flowers terminal or in axils of upper leaves or leaf-like bracts, 1 or in +- dense cymes or along short shoots, sessile or not, subtended by 2 bractlets. Flower: bisexual, generally radial; hypanthium bell-shaped to cylindric, membranous or leathery, persistent in fruit; sepals appearing as hypanthium lobes, 4--9, epicalyx lobes alternate sepals or 0; petals, stamens inserted on inner hypanthium; petals 4--6 or 0, alternate sepals, crinkled, deciduous; stamens generally = or 2 × sepals, included or exserted; ovary generally superior, chambers 2--6[many], style generally slender, stigma head-like. Fruit: dry capsule or leathery berry, dehiscent into 2--4 valves or irregularly. Seed: 3--many. Genera In Family: +- 28 genera, 600 species: temperate, tropics, generally in wet habitats. Some ornamental or cultivated for medicine, dyes. 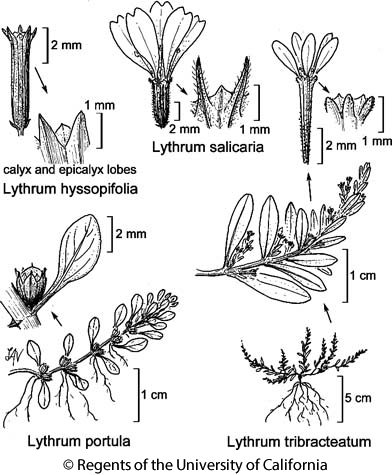 Note: "Epicalyx lobes" (lobes on calyx) formerly called "appendages," "hypanthium" in Lythraceae (and Onagraceae) including receptacle, sometimes called "flower cup" or "flower tube". Punicaceae (Punica) included here. Habit: Annual, perennial herb. Stem: prostrate to erect, often 4-angled. Leaf: opposite, alternate, or whorled, linear to ovate or obovate, petiole 0 to short. Inflorescence: flowers generally 1--2 per axil, sessile or not. Flower: radial to +- bilateral, of 1--3 style forms (heterostylous); hypanthium cylindric or bell-shaped, ribs generally conspicuous; sepals 4--6, deltate, epicalyx lobes < to > sepals; petals 4--6 or 0; stamens 4--6 or 12, included or exserted; styles < to > stamens. Fruit: capsule, generally cylindric, rarely spheric, valves 2. Seed: many, < 1 mm. Habit: Annual, not heterostylous. Stem: extensively creeping or decumbent, rooting at nodes, 5--25 cm, +- red, glabrous; branched at base. Leaf: 0.5--1.5 cm, opposite, oblong to obovate, fleshy. Inflorescence: flower 1 per axil, +- sessile. Flower: hypanthium 1--2 mm, broadly bell-shaped; epicalyx lobes awl-shaped, 0.5--1 mm, 1--2 × sepals; petals +- 1 mm or 0, white to rose-pink; stamens generally 6. Fruit: +- spheric, > hypanthium. Chromosomes: 2n=10. Citation for this treatment: Shirley A. Graham 2012, Lythrum portula, in Jepson Flora Project (eds.) Jepson eFlora, http://ucjeps.berkeley.edu/eflora/eflora_display.php?tid=32406, accessed on April 25, 2019. No expert verified images found for Lythrum portula. CaR, n SN, ScV; Markers link to CCH specimen records. Yellow markers indicate records that may provide evidence for eFlora range revision or may have georeferencing or identification issues. Purple markers indicate specimens collected from a garden, greenhouse, or other non-wild location.